The King is Still Swinging! 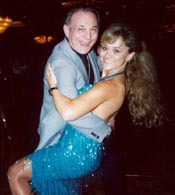 "From the 30s thru the 90s is quite a span, and plenty of mileage on my dance shoes. The wonderful times and dancers I have met throughout the country have been most gratifying in my long life, spent mostly in southern California, although Las Vegas has been my home for the past 10 years. Las Vegas isn't noted for dancers, but as long as there are conventions to go to, it is well worth it. The young Lindy Hoppers are doing there thing here----and very exciting to watch. "I've heard soooo much about the D.C. dancers and locations, hopefully I can make it back there sometime. The new rage of Lindy Hop around the country is really catching on. "It takes dedicated dancers to keep it going and really appreciate someone like you two to keep the stimulation ongoing. Keep up the good work. This is a start --- I will try to wrack my brain and give you a small version of my history. To know me, you had to be there. Great years of dancing." A word of caution: Maxie sent us so many wonderful photos that we have had to break them down into "Sub-Pages" so that you can load them in a reasonable amount of time. So, without further ado, here are your choices. Click on the little cameos to visit the page of your choice.